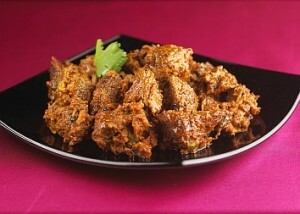 Fry Meat recipe by Saima Asif at DesiRecipes.com. FIRST OF ALL WASH THE MEAT AND THEN MIX ALL THE INGREDIANTS EXCEPT OIL AND ONION AND LEAVE IT FOR 1-2 HOURS. AFTER THAT PUT THE PAN ON HEAT THEN PUT THE OIL IN THE PAN THEN FRY HALF OF THE ONIONS TILL IT BECOMES TRANSPARENT BUT NOT BROWN. THEN ADD THE MARINATED MEAT AND FRY IT FIRST ON LOW HEAT FOR 10 MIN THEN FRY IT ON HIGH HEAT TILL IT TENDER. AFTER THAT PUT THE KOAYLA ON HEAT MEAN WHILE FRY THE REST OF THE ONION TILL BROWN AND ADD IT ON THE TOP OF MEAT. THEN PUT A SMALL PIECE OF BREAD ON THE TOP OF MEAT THEN PUT THE KOAYLA ON IT AND THEN PUT SOME DROPS OF OIL ON IT AND KEEP IT COVER FR ATLEAST 5 MIN. AFTER 5 MIN KEEP THE KOAYLA OUT OF IT .